One of the five regular convex polyhedra known as the Platonic solids. The one polyhedron everyone is familiar with! This model was made from a single connected net, printed on one sheet of A4 paper. Nets can be generated and printed at any size using any of Small Stella, Great Stella, or Stella4D, even in the free demo versions. Here's a cube in Stella, using a 3-view layout featuring the cube itself, the unfolded net, and a partially folded net. See more screenshots here. Here is a compound of the cube with its dual. Notice how the cube's vertices sit above the octahedron's faces, and vice versa? Also the edges of the two polyhedra bisect each other at right-angles. Multiple cubes can be arranged in an intersecting manner to form various compounds. Here is one consisting of 3 intersecting cubes. Here is another compound consisting of 4 intersecting cubes. Here's the best-known cube compound, consisting of 5 intersecting cubes. The cube has no stellations but it does have one fully symmetric faceting, the Stella Octangula. You can see that it has the same vertices as a cube. This faceting is also a compound of two tetrahedra and a stellation of the octahedron. 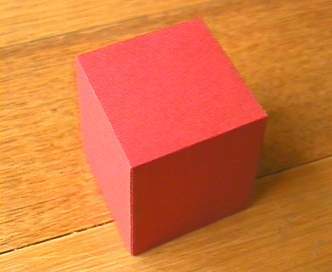 The cube also has subsymmetric facetings, meaning they have less symmetry than the cube itself. Here is an example. Again, you can see that it has the same vertices as a cube. The yellow faces are rectangles that cut through the centre of the model. The blue faces are bow ties, that is, crossed quadrilaterals rather than two separate triangles.